In the home, an essential part of an everyday routine is the adhesive tape. To fix up anything cracked or broken, we take the help of this simple invention to reuse that once damaged item. They are also used to pack the box containing a vast amount of luggage so that the things in it do not get misplaced. Tapes are there in every field of lifestyle one way or other. Different categories of tapes are available in the market to cater the needs for various purposes. One such type is the sports strapping tape or athletic tape as it is a popular term. The usage of the athletic tape is the necessity for every sports person. The purpose of sports tape is to provide structure and protection to the particular parts where it is applied. Going a bitanatomical, it maintains and controls the motion of the injured joints and gives compression to the soft tissues to prevent a sudden swelling outbreak. They are also applied to the old injury to shield that area from getting re-injured again and again and quicken the healing of already injured part. The recommendation is always given to every sports people to carry their athletic tape in their kit bag. So how it works? Sports or athletic tape placed and taped carefully to provide support to the ligaments and capsules surrounding the injured part to limit excessive or any unwanted anatomical movement which aggravates the injury further. You can also tape them on those parts of your body where there was any old injury in the past to protect that part to get injured and relapse the injury. Kenzo Kase, a genius chiropractor in the year 1970, introduced the use of Athletic Tape. The attention to this tape reached its height when beach volleyball player, Kerri Walsh used it at Beijing Olympics, 2008. After that, form recognized sportspersons to a novice sportsman, athletic tape have become their part and parcel. · Cohesive Tape or bandages. 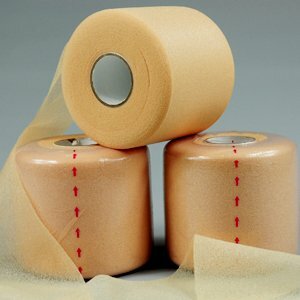 You must apply the tape in the upper limb area such as shoulder,shoulder joints, and muscle, abdomen, wrist, arms, fingers; while ion the lower limb area, they are applied on the thigh, knee, Achilles heel, ankle, foot, toes. Tapes made in such way that they can withstand, multiple physical activities, daily showers, humidity and moisture and even the water of the pool. Before using athletic tape you must always apply it carefully to not rigid your movement entirely, but only restrict that much which would speed up the recovery process. It is also very essential to know about the right kind of tape for the right part of your body. It must be applied to leave no part unprotected. If you keep these simple points in mind, these tapes would well serve your purpose.